Manage real-time records easily, with colour-coded tracking and reliable reporting for the most efficient administration of thesis evaluation in the world today. Offer easier collaboration between your institution and internal and external examiners with secure communications, tracking and online submissions of evaluation reports. One-click workflow approval. Automatic email notifications and automated reminders to evaluators for pending approval and dissertation requirements. Enterprise-level software architecture facilitates easy integration with your institution’s existing systems, plagiarism checks and other third-party tools. Unique, browser-based thesis evaluation software, developed and tested over 4 years by our expert software-solution architects with fully-acquainted academic domain knowledge. A comprehensive end-to-end solution offering complete automation of thesis tracking and dissertation procedures. Examinater supports unlimited theses submissions and tracking of thesis dissertation-status online. It replaces manual, time-consuming and costly requirements with secure, IT-enabled solutions. Examinater is customised precisely to your institution’s needs. 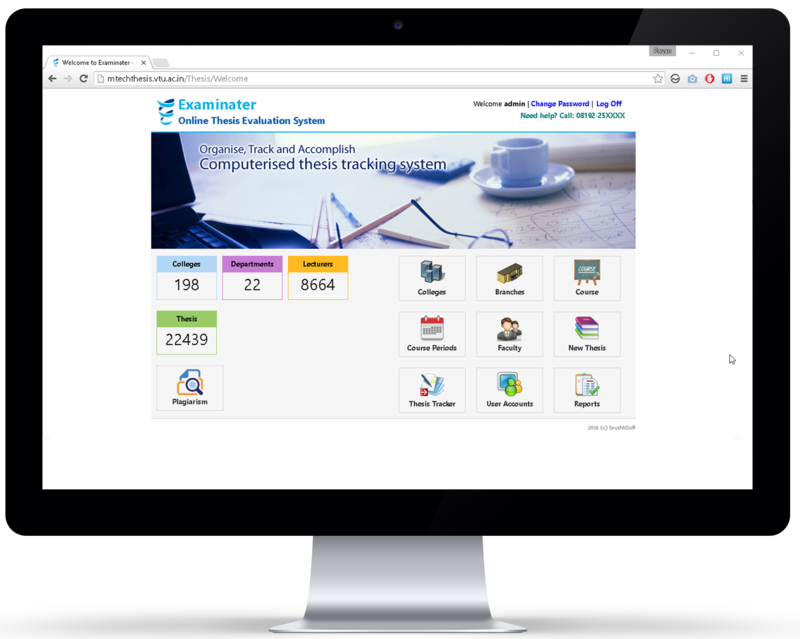 Please contact us directly to know more about Examinater and for a demonstration of how it improves your operational efficiency. One of India’s largest and most prestigious technological universities. The software system is started by your company is extremely good. The thesis evaluation and announcing the results is very fast. Also it does not take much time to finalize the examiners. All the work automatically happens through the software. It is very good. Dr.Arun H.R. Govt. S.K.S.J. Technological Institute,Bangalore. This software is new adavancement in examination system. Definately in future it will impact other universities also. I reccomend others to use this software for there examination work. SrushtiSoft has been assigned with the supplying installation and commissioning of online Ph.D, M.Tech, MBA and MCA thesis evaluation software. The said company has supplied the software and it working satisfactorily. The process has reduced drastically, the evaluation time/ problems. The system is primarily much beneficial for the students as in the earlier process they used to wait quite a long time for the Viva- Vice after the thesis submission. On the other hand it is value addition to the University. Absolutely it is to be appreciated. Dr.Sreenivasa Reddy M, R.L. Jalappa Institute of Technology, Doddaballapura. "In the first year, 200+ institutions and 2700+ professors enrolled, managing the evaluation of 7000+ theses with Examinater. This continues to grow." For a free demonstration on the grounds of your university. © SrushtiSoft 2018 All Rights Reserved. Made with love by SrushtiSoft.